When it comes to oiled floors, we use only oils which offer ultraviolet protection, so sunlight will not damage your custom finish or lighten your floor. However, regular cleaning and maintenance with the right products is essential to maintain your floor’s natural beauty and prolong its life. 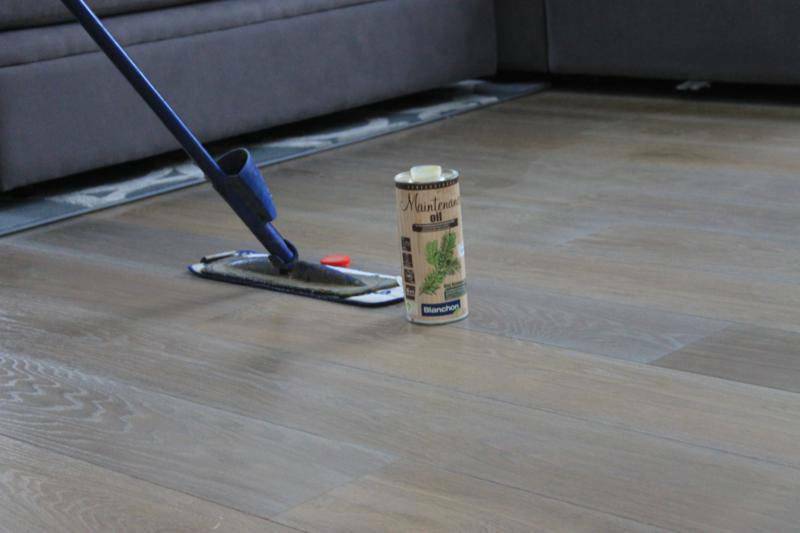 Plus, it’s vital to know what – and what not – to do to care for your floor properly. Dog claws will scratch your floor, so keep them trimmed short. Take shoes off if you can because the tread in trainers usually holds small stones and grit. ALWAYS remove high heels, as the pressure created under the heel is immense – at least 60 times greater than you’ll find under the average car tire! Buy and fit pads to the bottoms of the legs of any tables, chairs, sofas or other furniture. Be sure to buy pads that are thick enough to protect your floor from the weight of each piece of furniture. We recommend ‘sticky-back’ felt pads as these are soft and do not lock in any moisture. Rubber pads should be avoided, as these can trap water and damage your floor’s finish. Put doormats near entrances to trap grit, because this will scratch or dent the floor if trodden in, and shake them out regularly. As with the ‘foot pads’ for furniture, do not use rubber-bottomed mats. They are not suitable for wood flooring because they can lock in moisture – especially at the door. Some parts of your floor may be stood on more often than others: for example, just in front of a sink or at the bottom of a staircase. Placing rugs or suitable mats on these areas will protect them. Soak any spills up immediately with a damp cloth (soaked in cold water only and then wrung out). Be sure that you have removed all of the split liquid, before removing any remaining moisture from the area with a clean dry cloth. Do not panic about spilt liquids, as it typically takes 24 hours for water, fizzy drinks or wine to leave a mark on an oiled floor. Food is also usually no cause for concern. 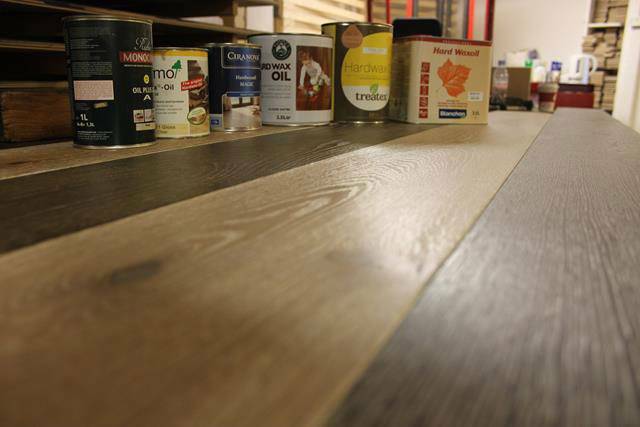 The only thing to be really wary of in the kitchen is hot oil, as this will liquify the hard wax oil used to finish your floor and enter the grain of the wood. The best way to keep your floor clean is to sweep it with a soft brush, or vacuum using a brush attachment. Do this regularly, as even small pieces of hard dirt can mark the surface if trodden in (another reason to remove your shoes). – metal or hard plastic attachments. NEVER use a steam cleaner, and NEVER mop the floor with water. Both of these can cause the wood to swell, warp or take on a grey finish. NEVER use wax, soap, or any other household cleaning product, as these will very often leave a residue that will dull and spoil the finish. If the floor gets dirty then we recommend using Bona Wood Floor Cleaner and the Bona Spray Mop. These are both specially made for wood floors and are the only cleaning products we endorse. The cleaner is formulated to leave not residue, needs no dilution and is ready to use straight from the container. If you buy the Spray Mop then this comes with a refillable cartridge to hold the cleaner, and a durable microfibre pad that is washable. The mop is manually operated with no batteries required. Depending on how much use your floor sees, it will usually require professional maintenance every three to to five years. 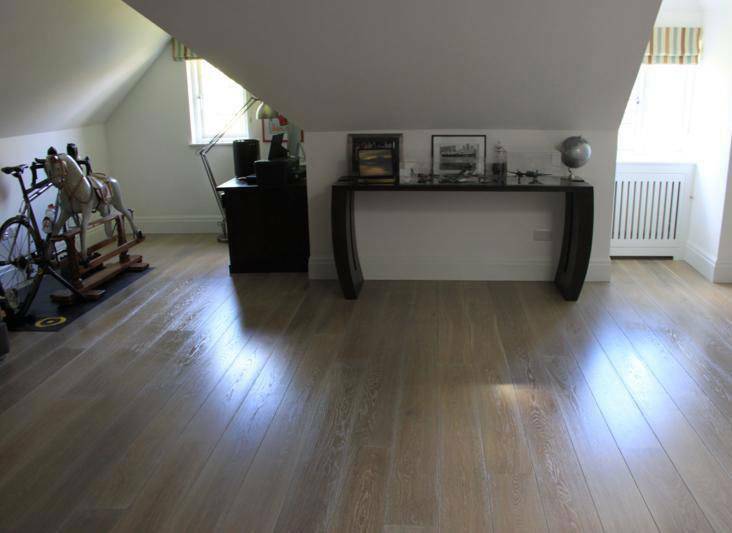 Not only do we offer this service, but we also offer FREE maintenance for the first three years on any bespoke floor we supply and fit. Read more about what makes us so different when it comes to after sales service.